Microsoft shut down development of the long-running Flight Simulator franchise in 2009 (details here). But the simulation lives on through an agreement with Dovetail Games that allows that company to release FSX on its online Steam platform (see this item from July 2014). Dovetail released the Steam edition this month, and the company has opened a discussion board to answer questions about the product. That online forum is the best source for details about this release of FSX and the company’s plans for future development. This is a re-release of FSX Gold Edition so you should not expect dramatic differences. However, we have updated it to include all standard Steam functionality, we’ve removed CD checking and combined the components of Gold Edition into a single installation. The major change we’ve made is in replacing the now-defunct GameSpy multiplayer systems with Steam features, enabling multiplayer to work seamlessly once again. Our aim in this first instance has been to ensure that the software will run for as many people as possible rather than radically improving or updating it. You can find a log of significant changes that Dovetail made to the FSX code here. The company’s discussion board is also the best source for information about add-ons, hardware compatibility, and related questions. Out of the blue, the controller directs you to fly a new heading that will take you out of your way. Perhaps you’re instructed to stop a climb or descent, frustrating your attempts to fly most efficiently. …(b) Except in an emergency, no person may operate an aircraft contrary to an ATC instruction in an area in which air traffic control is exercised. Many pilots argue about the applicability of that rule in the situation described here, and they quibble about distinctions between clearances and instructions. Pilots flying in controlled airspace must comply with all ATC instructions, regardless of whether the pilot is flying VFR or IFR, in accordance with § 91.123(b). ATC instructions include headings, turns, altitude instructions and general directions. The Pilot/Controller Glossary of the Aeronautical Information Manual (AIM) defines ATC instructions as “[d]irectives issued by air traffic control for the purpose of requiring a pilot to take specific actions; e.g., ‘Tum left heading two five zero,’ ‘Go around,’ ‘Clear the runway. ‘” See AIM, Pilot/Controller Glossary. In contrast, the Glossary defines advisory as “[a]dvice and information provided to assist pilots in the safe conduct of flight and aircraft movement.” Id. A pilot flying VFR in Class E airspace, which is controlled airspace, is not required to communicate with ATC; however, if a pilot is communicating with ATC and ATC issues an instruction, the pilot must comply with that instruction. …if a pilot is communicating with ATC and ATC issues an instruction, the pilot must comply with that instruction. That statement is also general, in that it applies even if you’re talking to a control tower, not a radar facility. e. PILOT RESPONSIBILITY. THESE SERVICES ARE NOT TO BE INTERPRETED AS RELIEVING PILOTS OF THEIR RESPONSIBILITIES TO SEE AND AVOID OTHER TRAFFIC OPERATING IN BASIC VFR WEATHER CONDITIONS, TO ADJUST THEIR OPERATIONS AND FLIGHT PATH AS NECESSARY TO PRECLUDE SERIOUS WAKE ENCOUNTERS, TO MAINTAIN APPROPRIATE TERRAIN AND OBSTRUCTION CLEARANCE, OR TO REMAIN IN WEATHER CONDITIONS EQUAL TO OR BETTER THAN THE MINIMUMS REQUIRED BY 14 CFR SECTION 91.155. WHENEVER COMPLIANCE WITH AN ASSIGNED ROUTE, HEADING AND/OR ALTITUDE IS LIKELY TO COMPROMISE PILOT RESPONSIBILITY RESPECTING TERRAIN AND OBSTRUCTION CLEARANCE, VORTEX EXPOSURE, AND WEATHER MINIMUMS, APPROACH CONTROL SHOULD BE SO ADVISED AND A REVISED CLEARANCE OR INSTRUCTION OBTAINED. Here’s another item from the FAA’s Aeronautical Charting Forum meeting on October 28-30. Ron Haag from FAA’s AeroNav Products (the division that produces charts and aeronautical data) said FAA plans to move all VFR chart publication dates to the same 56-day dates used for IFR charts and data. 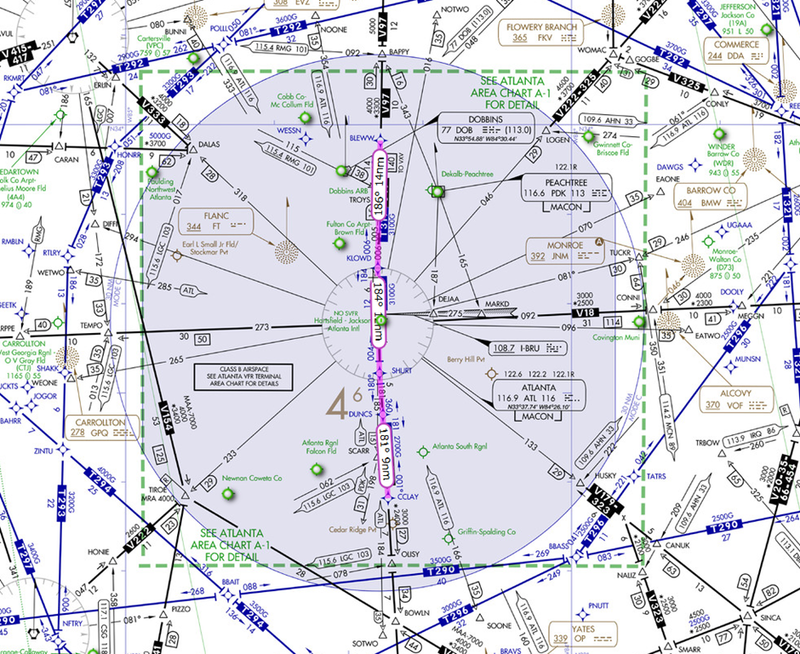 The new dates will also link VFR charts with updates to airspace. The schedule allows AeroNav Products to better align updates to adjoining sectionals and Class B areas. For example, the Las Vegas, Los Angeles, and Phoenix charts would all be published on the same date. The new 56-day cycle is possible because a new print contractor has increased capacity. Haag’s presentation notes that eventually AeroNav Products plans to update all digital VFR charts on a 56-day cycle, which will be good news for the increasing number of pilots who have gone paperless. Members of the forum raised several questions about synchronizing printed and electronic charts and how NOTAMs will be handled. According to the minutes of the meeting, Haag said his group is working through those issues. FAA has outlined a concept for overhauling the current network of low- and high-altitude airways. The plan is part of the FAA’s initiative to move toward performance-based navigation (PBN). At present, the proposal is just that—it isn’t a formal program with full funding. The presentation, given at the FAA’s Aeronautical Charting Forum meeting on October 28-30, is available as a PDF in my Aviation Documents folder at OneDrive. 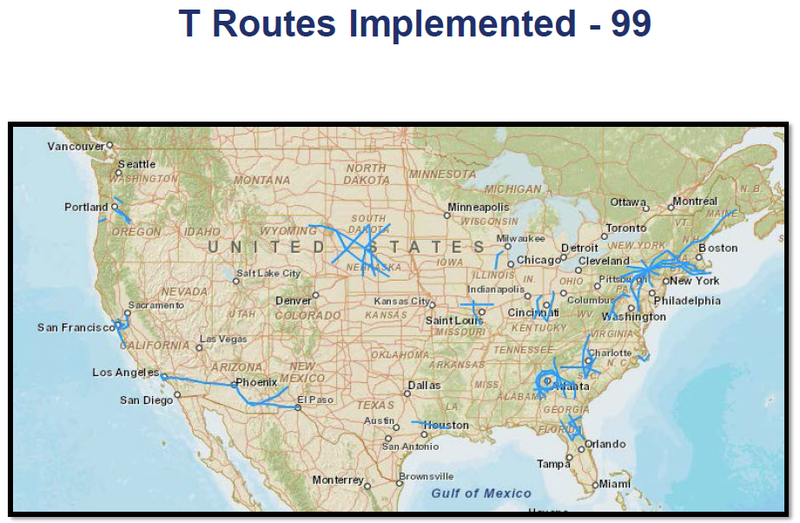 Route structure requirements will be based on factors such as traffic demand, airspace utilization, ATC task complexity, airspace access, and user operational efficiencies. Ground based airways will be retained in areas of with poor radar coverage and in mountainous terrain. Pilots of light aircraft are most concerned about low-altitude airways and routings, including the venerable victor airways and newer T-routes. 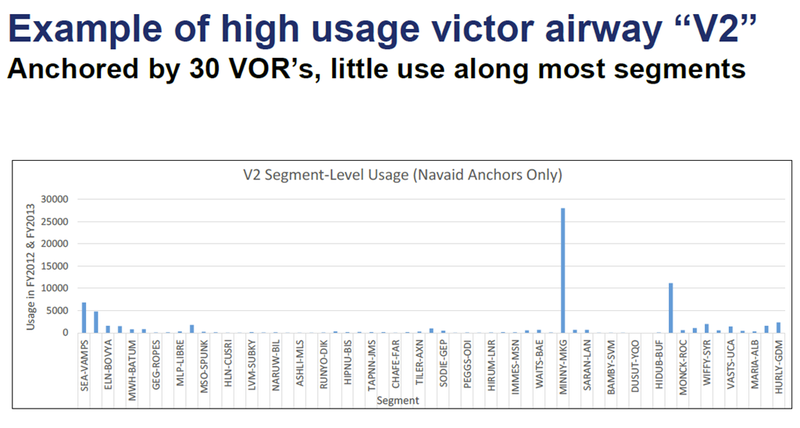 The presentation includes an interesting slide that shows daily utilization of victor airways. The average for the top 81-100 low-altitude airways was just 3 operations (in FY2013). The graphic below shows how V2, which runs east-west across the northern part of the US, was used in the last two fiscal years. Very few aircraft flew most segments of the airway. Note that the segment that crosses the Cascades east of Seattle (SEA-ELN) gets regular traffic. Other segments, such as MINNY-MKG across Lake Michigan, and legs near BUF, are also well-used, probably due to ATC requirements in these high-traffic areas. 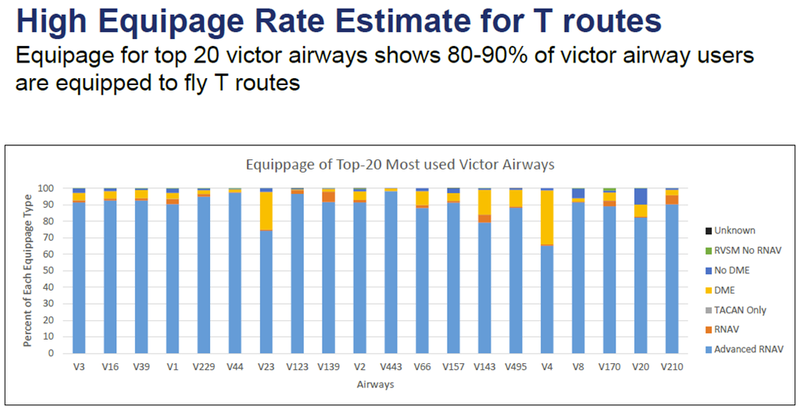 The FAA notes that 80-90% of the aircraft flying the 20 most-used victor airways are already equipped to fly T-routes, which require an IFR-approved GPS. The proposal advocates retiring existing point-to-point navigation programs to give pilots more flexibility in planning and filing direct routes. 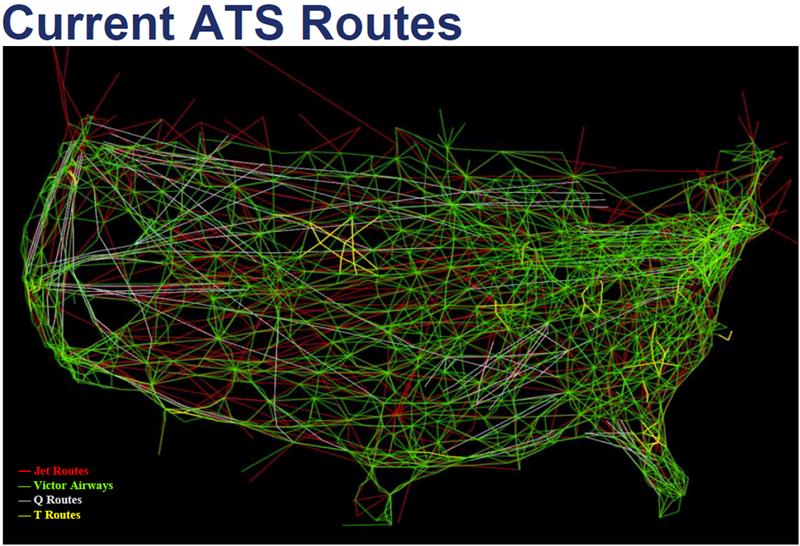 FAA says it will work with users to create a network of optimally placed waypoints. When specific routes are required, the plan would expand the network of ATC IFR preferred routes, which would not necessarily follow existing airways. Point-to-point navigation would available elsewhere. For example, the program noted that T-319 passes directly over KATL, giving controllers a straightforward way to route aircraft through the Atlanta Class B airspace. Two representatives from the FAA recently provided an update on the agency’s plans to decommission VORs. The presentation, given at the FAA’s Aeronautical Charting Forum meeting on October 28-30, is available as a PDF in my Aviation Documents folder at OneDrive. The presentation largely recapped information described in briefings and white papers (described here, here, and here), but it did restate several key points and provide some new information. The VOR MON Program will implement the [minimum operational network of VORs] by decommissioning 30-50% of the VORs in the NAS by 2025 (although the current plan retains all VORs in the designated mountainous region of the U.S.—roughly the western third of the country). The reduction will begin gradually over the first five years during which time the bulk of the procedural/airway/airspace work will assessed. Then the plan is to accelerate the process, with 20-25 VORs shut down each year. Only FAA owned/operated VORs will be considered for shutdown. DMEs and TACANs will generally be retained. 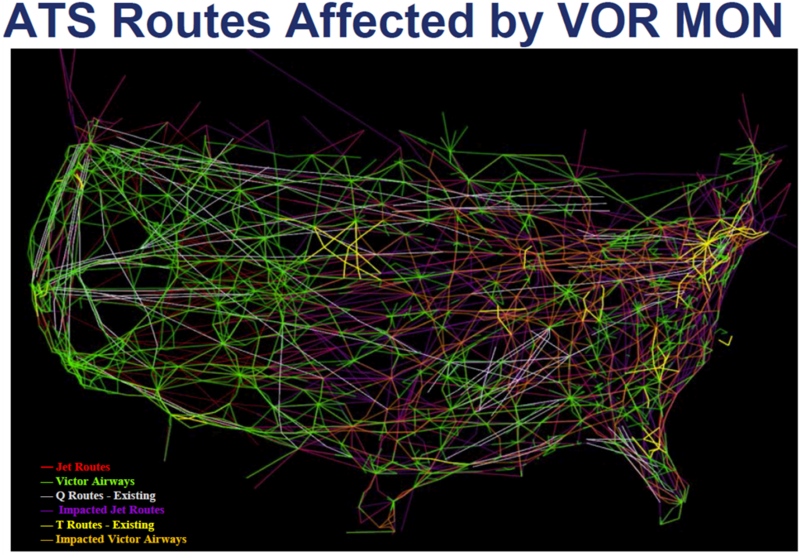 Many of the remaining VORs will be enhanced to supply increased service volume. VOR standard service volume (SSV) will become 77 NM radius at 5000 ft. AGL. Increase support for direct navigation between VORs without airways. Retain sufficient ILSs, LOCs, and VORs to support “safe-landing” at a suitable destination with a GPS-independent approach (ILS, LOC or VOR) within 100 NM of any location within CONUS. Provide seamless VOR coverage at and above 5000 ft AGL. More than 5,000 instrument approaches may be affected by the reduction in operational VORs. Nearly 1,300 SIDs, STARs, and ODPs may be affected by the reduction in operational VORs. FAA is considering how to refer to and chart DME-only facilities. Graphics in the presentation include a pair of maps that show how the current airway structure will be changed when the MON is established. FAA has published new regulations and guidance for pilots and instructors who use aviation training devices (ATD). On June 27, 2018, FAA published several important changes to 14 CFR Part 61 that expand the use of ATD, FTD, and FFS to maintain IFR currency. You can read about those changes at BruceAir here. First, FAA published AC 61-136A: FAA Approval of Aviation Training Devices and Their Use for Training and Experience on November 17, 2014. This updated document provides information and guidance for manufacturers of ATD and for instructors and pilots who intend to use a BATD or AATD for activities involving pilot training or certification under 14 CFR Part 61 and 141. FAA published AC 61-136B in September 2018. For more information about that update, see New AC for ATDs. The updated AC also explains the requirements for obtaining a letter of authorization from the FAA for all ATDs. That LOA must be renewed every five years. On December 3, 2014, FAA published changes to 14 CFR Part 61 and Part 141. (You can read the full announcement of the changes in the Federal Register here.) The changes are effective January 20, 2015. (2) Approved by the Administrator for the tasks and maneuvers. (b) Aviation training devices. Each aviation training device used to obtain flight training credit in an approved pilot training course curriculum must be evaluated, qualified, and approved by the Administrator. (c) Training aids and equipment. Each training aid, including any audiovisual aid, projector, tape recorder, mockup, chart, or aircraft component listed in the approved training course outline, must be accurate and appropriate to the course for which it is used. (1) The course may include training in a flight simulator, flight training device, or aviation training device provided it is representative of the aircraft for which the course is approved, meets the requirements of this paragraph, and the training is given by an authorized instructor. (2) Credit for training in a flight simulator that meets the requirements of § 141.41(a) cannot exceed 50 percent of the total flight training hour requirements of the course or of this section, whichever is less. (3) Credit for training in a flight training device that meets the requirements of § 141.41(a), an aviation training device that meets the requirements of § 141.41(b), or a combination of these devices cannot exceed 40 percent of the total flight training hour requirements of the course or of this section, whichever is less. (4) Credit for training in flight simulators, flight training devices, and aviation training devices if used in combination, cannot exceed 50 percent of the total flight training hour requirements of the course or of this section, whichever is less. However, credit for training in a flight training device or aviation training device cannot exceed the limitation provided for in paragraph (b)(3) of this section. Some ground instructors have asked about their ability to provide instruction to pilots using ATDs and flight simulators. The FAA has published two letters of legal interpretation to clarify this matter. The Gatlin letter, issued on September 24, 2010, discusses whether an Advanced Ground Instructor or Instrument Ground Instructor is an “Authorized Instructor,” as defined in 14 CFR 61 for purposes of giving instrument instruction to candidates for pilot certificates and ratings. The letter explains that ground instructors are authorized to provide only ground training and are not specifically allowed to supervise training time in a flight simulator or training device for purposes of logging time toward an instrument rating or pilot certificate. The Frick letter, issued on March 30, 2011, backs up that interpretation. It explains that a ground instructor may use training devices as tools, or aids to instruction, but the time cannot be counted towards meeting the aeronautical requirements for a pilot certificate or rating. In addition, the Frick letter notes that ground instructors may provide instruction in a training device or simulator that helps a pilot meet proficiency requirements. Again, a ground instructor use the devices as tools during training, but that time may not be logged, endorsed, or credited towards recency experience for maintaining a rating. Many pilots who use sophisticated GPS-based navigators have difficulty consistently loading and flying approaches. As I’ve noted elsewhere, pilots who use the vectors-to-final option may find themselves scrambling to comply with a clearance that directs them to a specific fix in the approach. Other pilots fumble with activating an approach, a process that sometimes leads the airplane in an unexpected direction. Many instructors, myself included, have long advocated using the flight plan page on your navigator to simplify flying instrument approaches (and SIDs and STARs). In fact, the flight plan page or menu is typically the most misunderstood and least-utilized feature of most GPS navigators. I’ve created a short presentation that guides you through the process of loading (and “activating”) an approach on the Garmin GTN 750. The presentation, Flying an Approach with the GTN 750, is available as a free PDF that you can download from the Aviation Documents folder at my OneDrive page. You can find many more useful, free references there. 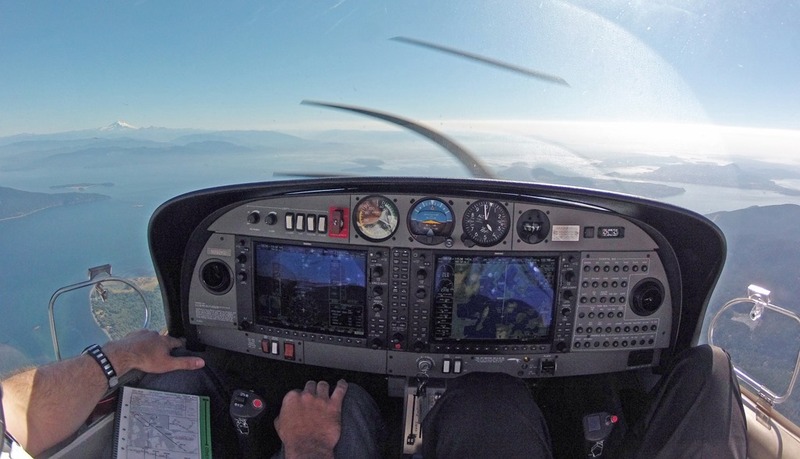 The basic technique and principles described in the presentation apply to most IFR-approved GPS navigators, but you should, of course, review the handbook and AFM supplement applicable to the unit in the aircraft that you fly. After reviewing the presentation, practice with the free simulators available from Garmin and fly with an instructor or safety pilot in VMC before you launch on an actual IFR flight.